Ten-year-old Annemarie must find the courage to go on a mission to save her best friends life... While the Nazi soldiers are "relocating" the Jews of Denmark. Lois Lowry, the author of numerous children’s books, recently received a letter from a teacher at the Taurus American College in Taurus Turkey informing her that her book Number the Stars was banned by the government. Lois Lowry fans were outraged, along with a slew of librarians and teachers. There were calls to contact the National Coalition Against Censorship and the ALA Office for Intellectual Freedom. Officials at the at the US Consulate in Adana found that the book is still at the library and available on the shelves. After all this came out, the inspectors stated that they questioned whether young children in primary schools should be involved in subjects with strong religious or political connotations. 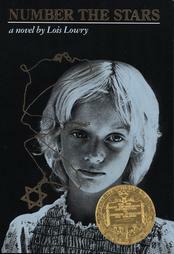 After reading about this controversy, first in School Library Journal, and then on Lois Lowry's website, my curiosity got the best of me and I bought a copy of Number the Stars to read since I never read it before. "What harm is a button shop? Mrs. Hirsch is such a nice lady." The afterward in the book describes the history Number The Stars is actually based on, and the story is fascinating. Nearly 7000 people, almost the entire Jewish population of Denmark, were smuggled across the sea to Sweden. Swedish scientists worked on a special powder made up of dried rabbits blood and cocaine which if sniffed by the search dogs would numb the sense of smell and thus prevent detection of people hidden away in the boats. *P.S. This Book is Kindle Ready! And it's a bargain at $4.40! I loved this book as an adult and read it aloud with my then 8-year old daughter. It was her first introduction to Holocaust literature. She "got it" and also loved the book. Censorship. I just can't go there. What are people so afraid of?! Both my son and oldest daughter read this book when they were in grade five as part of their curriculum. Though my youngest has read a few WWII novels, she hasn't yet tackled any Holocaust literature. Number the Stars would make a great "together" read. Thanks for the review! Thats a perfect way to describe the way Number The Stars is written- the story presents itself without overwhelming you with details, so you "get it". Thanks for sharing! Sounds like a wonderful book. I had never heard of it. Thanks for the review. Number the Stars is actually the only Lois Lowry book I've read (I know, I know, I'm planning to get to the Giver sometime) and it kind of surprises me that the Turkish government would find anything offensive in it. If it was about their government then yeah, I could understand (but still vehemently disapprove because I hate censorship of any kind) but seriously, it's not even about Turkey. What's their issue? This isn't even going into the fact that they haven't read the whole thing. I remember this book! I read it in late elementary or early middle school. I think it was a little bit above my head, context-wise, but I DO remember the fear/confusion/urgency even if I didn't quite understand the political situation. What a great reminder - I'll have to go find a copy at the library now and re-read it! I have always, and will always, love this book. Even looking at the cover gives me chills. Thanks for reminding me of this old friend. I think it's wonderful that this is a staple in grade school curriculum! And I think it's a great idea to read it together with your youngest! You'll have to let us all know if she enjoyed it! I'm glad I could recommend something new! And Lois Lowry is a wonderful YA writer. I'd love to see her tackle adult literature! It amazes me to this day that there are people, let alone governments, that try to censor books! In the School Library Journal link I put up, the writer points out that the US House Foreign Affairs Committe adopted a resolution declaring the Ottoman-era killings of Armenians as genocide. This all happened around the time of WWI. The writer believes there is some connection between the resolution and the banning of a US book related to another "genocide". Is this grasping for a reason? In any case, the book is so well written that I would think it's an asset to have Number The Stars as an way to introduce the subject. Hi Bashtree & Connie! I must be the only one that never read this in school!...OK, I just looked up the date Number The Stars was published, and that explains why I didn't read it in school- it wasn't published yet! :-) Gosh, I didn't think I was THAT old! I wasn't aware of the Danes efforts either... Another book that was wonderful and told the true story of a group of Italian citizens that sheltered over 40,000 Jewish people from execution is THREAD OF GRACE by Mary Doria Russell. This is a great book..I read it to my students for many years. No book should be banned -- It should be up to the individual, or, in the case of minors, guided by an adult. Sounds like a good book. Why would Turkey ban it after reading only a bit of it? How odd. thanks for the review.